Tutorial 1. Taking Measurements. Making Calculations and Adjustments. Preparing for the Cutting Process. Tutorial 2. Transferring the Pattern on Fabric. Tutorial 3. Marking the Position of the Busk. Cutting the Corset. Tutorial 4. Adding the First Vertical Bones. Assembling the Front of the Lining. Tutorial 5. Sewing Bones on the Cups: Important Tips. Tutorial 6. Pressing the Cups. Adding Intermediate Bones. Tutorial 7. Finishing the Slits. Joining the Rest of the Pieces. Tutorial 8. Adjusting the Size of the Corset. Sewing On the Rest of the Bones. Tutorial 9. Joining the Face Pieces. Pressing the Garment. Tutorial 10. Joining the Face with the Lining. Tutorial 11. Installing Steel Busk Plates in the Corset. Tutorial 12. Sewing Boning Tunnels. Tutorial 13. Installing Plastic or Steel Spiral Bones. Tutorial 14. Finishing the Bottom Edge of the Corset. Tutorial 15. Installing Grommets. Sewing a Modesty Flap for the Lacing. Tutorial 17. Cutting the First Part of the Skirt. Tutorial 18. Assembling the First Tier. Tutorial 19. Cutting the Second Tier. Joining the Two Tiers of the Skirt. Tutorial 20. Sewing Yoke Darts. Adding a Waistband. Perfect solution for proms, celebrations, costume parties and other special events. The first thing to do is take measurements off the girl. I tie three cords around her body: one around the waist, another below the bust, and still another around the stomach. The process is illustrated in pictures with great detail. People often ask me where exactly to tie the cords and whether the measuring tape should be tight or not. Let me show you how I do it. They are all standard measurements, i.e. the same measurements you take off an adult. The only difference about sewing for a teenage girl is that you must tie a cord below the bust (i.e. along the under-bust line) because her side length and waist to under-bust measurements don't fall into any particular standards yet. It is important to take and record this measurement. The distance from the under-bust line to the waistline will define the ratio for adjusting the standard pattern. You can adjust the width of the back if you want to form extended corners for attaching shoulder straps. You can also measure the distance from the waistline to the bottom of the corset along the back if you have some unconventional design idea on your mind. Once all measurements have been taken and recorded, you will need to do some calculations and customize the standard pattern accordingly. You will draw a table, fill it in with all key measurements taken off the girl (column 3) and all measurements of your standard pattern (column 2), and carry out all relevant calculations. I have tried my best to explain these simple calculations and formulas as thoroughly as possible and used different colours to highlight things. Let us analyze and compare her measurements and the measurements of the standard pattern. Look at the circumferences: bust circumference, under-bust circumference, waist circumference, and stomach circumference of our 15 year old girl basically coincide with the standard measurements of the pattern designed for a grown woman. In fact, some are even larger. There is one very significant difference though. Please pay attention to two key measurements which must always be taken off a teenage girl: bust to waist and waist to under-bust. Take a look here: the distance from the bust line to the waistline is 22cm on the pattern and 20cm on Olga, and the distance from the waistline to the under-bust line is 14cm on the pattern and 12cm on Olga. As you can see, the girl's bust line and under-bust line are positioned 2cm lower, i.e. closer to the waistline. This means that her torso is still somewhat short although her body is already very close to a grown woman's body. And, therefore, I will need to adjust not only the circumferences (which is what you normally do anyway) but also the length of the pattern. There is another very important detail: Olga's side length measurement is exactly the same as on the pattern. Do not let this misguide you! You might assume that the bust lines and the under-bust lines are positioned at the same level if the side length measurements are the same. No, they are not! This is the reason why the bust to waist and waist to under-bust measurements are a must when you are sewing for a teenage girl. They indicate the position of the bust line! Let me demonstrate it schematically now; and in the next tutorials we will adjust the actual patterns on fabric. First, you need to draw a bust line. And then you can transfer the ready patterns on fabric. But, since the bust line and the under-bust line need to be shifted 2cm closer to the waistline, I simply shift the central front piece and the intermediate front piece 2cm down. Now the bust line is positioned correctly. But then, we should not forget that Olga's side length measurement coincides with the measurement of the standard pattern. And this means that I need to re-draw the armscye line to restore the initial side length of the intermediate front piece. The bust line is placed lower than it was originally though. Next, as follows from the measurements, I need to shift the central front piece 0.5cm inwards against the fold line of the fabric because Olga's Bust Apex to Bust Apex is 1cm smaller than on the pattern. And then, in keeping with the values recorded in the table, I shift the front side seam line 1.5cm outwards and the back side seam line 1cm inwards. The back princess seam also needs to be altered to comply with all circumference measurements: I shift it 0.8cm outwards at the top, 1.5cm outwards at the under-bust line, 0.5cm inwards at the waistline, and 0.8cm inwards down the bottom, at the stomach line. In this particular case, the client's side length measurement coincided with the measurement of the standard pattern despite the young age, while her bust line and under-bust line had to be shifted lower down. Sometimes though, a teenage girl's side length measurement may also be smaller than on a standard pattern designed for a grown woman. In this case, you are not supposed to add the area marked with an arrow. The side front piece and the back pieces need to be adjusted down in correspondence with the adjusted intermediate piece. Their length must be adjusted down by the same value as on the intermediate front piece. Many people tend to make the same mistake: they move from the top of the pattern to the bust line and then to the under-bust line. Never do it this way! You should shift the original bust princess seam line and then carefully bring it to the original under-bust line. People often get it wrong although it is very important! Sometimes, your client's side length and bust width front measurements are both smaller than on the standard pattern. In this case, you should use a combined technique: re-draw the princess seam first and then shift the altered pattern down to shorten the side length accordingly. After reducing the side length, you can adjust everything else. In any case, I would like to repeat the following: as soon as you change the bust princess seam, you automatically change the configuration of the cups, which means you had better abandon the technique of shaping the cups with the help of bones. 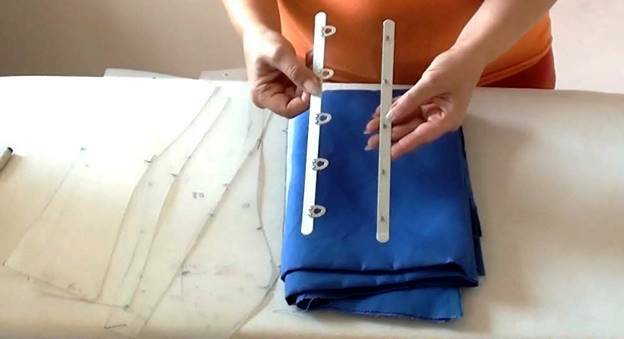 Stick to the simplified corset-making technique instead. Olga's corset will be sewn from non-stretch linen fabric and feature a steel busk as was requested by many of our readers. 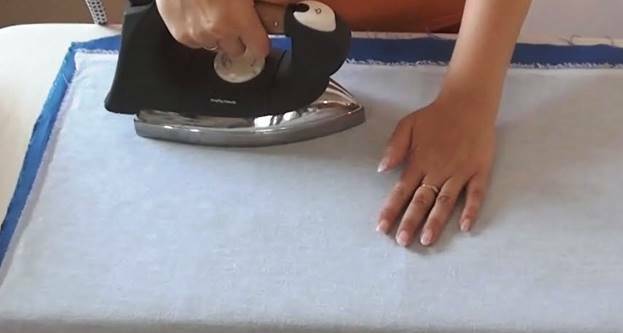 I will show you how to sew it in and how to fasten it. I will use a standard pattern designed for a grown woman. You can find it on all Corset Academy DVDs dedicated to sewing opaque corsets with boning in the cups. I arrange the pieces the way I will arrange them on fabric to figure out the consumption of iron-on material. I multiply the width and the length of the lay by two because I need to cut a lining and a face. I prepare a piece of iron-on fabric, put it down, and starting duplicating the main fabric. Now, I need to fold the duplicated fabric in half, transfer the patterns on it, and then fold it lengthwise to cut the face and the lining simultaneously. Become a member to have access to sewing patterns! Upgrade to the Premium membership to get your personal diploma!